Chop the baby corns lengthwise & keep aside. Mix besan, cornflour, soyasauce, ajinomoto, chilly powder, turmeric powder, onion, baking powder & salt together. Also, combine the chopped baby corns & sprinkle some water. Mix well. 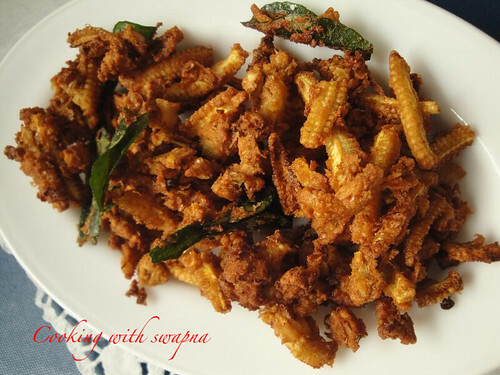 Heat the oil in the frying pan, fry the baby corn mixture till crispy & golden brown. 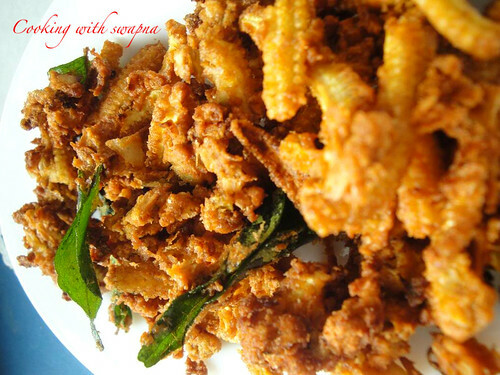 Finally, fry the curry leaves & add them in the fried baby corns. Wow.. am drooling over them swapna..! Yummmy dear! Try participating in my FIL-Milk event! This is something new, never tried baby corns in this style, sounds delicious! Sounds like a great snack with tea. Crispy and crunchy!